[prMac.com] Windeck-Rosbach, Germany - EUROCOMP today proudly announces an update to Timing, the unique new time tracking application for OS X. In contrast to classic time tracking applications, Timing 1.3 doesn't require users to manually operate timers. Instead, users' activities like editing documents, surfing the web, and playing games are tracked automatically and can be easily reviewed at a later time. This avoids inaccurate time logs and the risk of forgetting to start or stop a timer is eliminated. A lite version (limited to todays' and yesterdays' data) is now available for a free trial prior to the purchase. The application is targeted at Mac users who are curious about how they spend time using their computer. Timing will give a detailed overview on how much time is lost playing games and browsing websites like Facebook and Twitter. Using these data, users can adapt their behavior in order to increase their productivity. Freelancers and other professional computer workers can leverage Timing to obtain an overview which projects consume most of their time, allowing them to bill their work hours more accurately. Timing tracks the path of the currently edited document and the domain of visited websites. It also supports grouping activities into projects for easier aggregation of data. 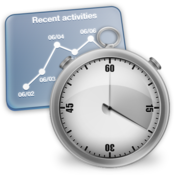 Thanks to this concept, users are able to check what activities they spent time on. Populating projects with data is as easy as drag-and-drop. Even though it collects sensitive data like the currently used documents, Timing will not compromise the privacy of its users. Recorded data stays safe on the users' computer and a customizable blacklist makes it easy to prevent selected activities from being tracked. In addition, any entry can be erased retroactively. Timing 1.3 is available on the Mac App Store for the limited-time reduced price of $3.99 (USD). For more detailed information, please have a look at the Timing homepage. Qualified reviewers are welcome to ask for a free promo code. Should you find Timing worth a note, we'd be more than happy to receive a short reference via email. The application icon, screenshots and more press material are available from the application's website. EUROCOMP is the brand and firm of Thomas A. Osthege and Daniel Alm. Thomas Osthege is an IT engineer with more than 35 years experience in data processing. He successfully developed microcomputers in the 70s and 80s, ran his own consulting firm and worked as a consultant for some very well known large companies. He's been developing Mac apps since System 7. Daniel Alm, his son (21), studies Mathematics and Physics at the University of Bonn, Germany. PocketCAS is his idea and development. Copyright (C) 2013 EUROCOMP. All Rights Reserved. Apple, the Apple logo, iPhone, iPad and iPod are registered trademarks of Apple Inc. in the U.S. and/or other countries.